NYC hotel opens in Times Square. New York City is a top travel destination for many with its diverse culture and top attractions. The Holiday Inn New York City - Times Square is conveniently located to Times Square putting travelers and guests in an ideal location for shopping, dining and sightseeing. This new hotel in Midtown Manhattan is only two blocks from the Theatre District. Travelers can enjoy a Broadway show or a dinner at one of the many restaurants in the area. Stroll the sidewalk for sightseeing and entertainment or board the subway for easy transportation. The hotel is located near New York Penn Station and Port Authority Bus Terminal. JFK International Airport, LaGuardia Airport and Newark Liberty International Airport are just a taxi ride away from this Manhattan hotel. Business travelers staying at the hotel can appreciate complimentary high-speed Internet access, an in-room work desk, and 24-hour Fitness and Business Centers to take care of all your business-related needs. 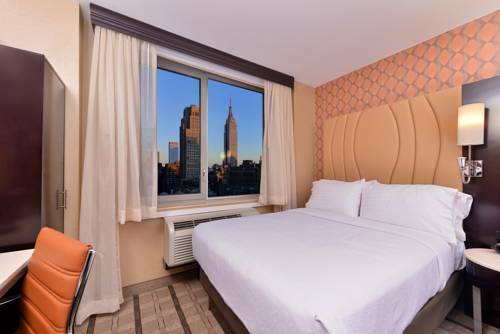 The hotel is located within walking distance to Jacob K. Javits Convention Center or just one subway stop on the 7 train This beautifully accommodated hotel has 35 floors with room views that overlook the Manhattan skyline. Theres also a full-service restaurant on-site, so you enjoy private dining as well. Come and stay at the Holiday Inn New York City - Times Square for a memorable traveling experience in New York City.